Plot with full planning permission for a 4 Bdrm Dwellhouse. Price over £89,000 Early entry. Viewing contact solicitors. 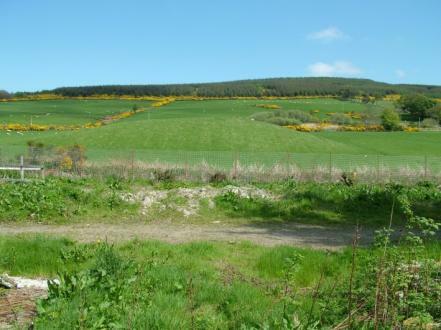 We are pleased to offer for sale a BUILDING PLOT at the former Yard of Gartly Station, Gartly, By Huntly. This Plot is a great building opportunity in a lovely rural location as the site has Full Planning Permission for a four bedroomed family home. In addition all services (mains water, electricity, BT cable, and sewerage) are on site ready for connection. A copy of the Planning Permission is attached to this Schedule for information purposes only. Further papers are available to interested parties. A copy of the Plan showing the extent of the subjects is enclosed for information purposes only. The plot is located off a shared private access road and benefits from countryside views to the front. LOCATION - The Building Plot is located in the picturesque Village of Gartly, which is a small community at the foot of the Coreen Hills. Gartly offers Primary School education and the nearby town of Huntly provides Secondary education at The Gordon Schools, Huntly (which is approximately 5 Miles from Gartly) is a long established prosperous market town on the main A96 road approximately 39 miles from Aberdeen and 59 miles from Inverness. Huntly is within easy commuting distance of Aberdeen, Inverness and Elgin and is on mainline rail and other public transport networks. Amenities include a Community Hospital, a choice of major Supermarkets and Sports and Leisure Facilities (including dining out, golf, fishing on the rivers Deveron and Bogie, bowling, cricket, football, swimming pool, skiing at the Nordic Ski Centre and many more). The town has a visible history with lovely traditional architecture, National Trust sites nearby and is a popular tourist centre during the summer months, giving easy access to the Grampians, Cairngorms, Royal Deeside, Strathdon and the Moray Firth.